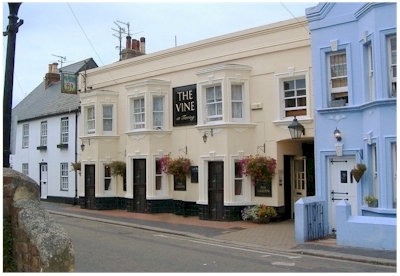 The Vine is the newest 'old' pub in the village of Tarring. The building itself dates back to around the 1600s. Despite its more modern appearance, there is no doubt the fascia is a Victorian style build, but we believe a timber framework may still exist underneath as reflected in many of the other buildings in that end of the street. 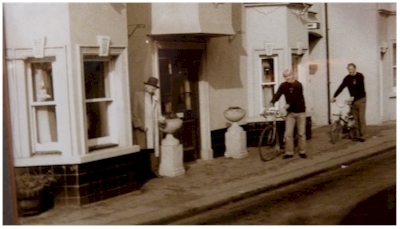 The picture (left), is possibly dated around the start of the 19th century and clearly shows the lower floor had three protruding bays each with their own door. 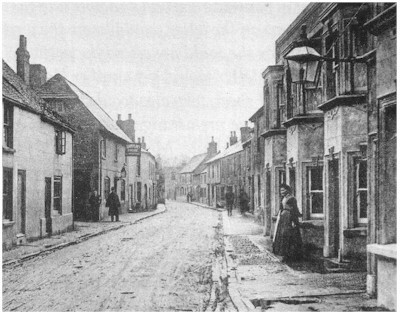 The woman standing out the front is thought to be Mrs Parsons, wife of Henry Parsons, Landlord. 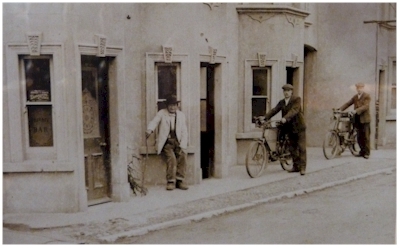 Today, we can clearly see that the central bay was removed and replaced with a single, wider double door, whilst those on each side were converted to windows - thus converting the building to single bar style. The picture above right is a depiction of what it would have looked like if unaltered. It has been said, that the landlord had for many many years, lived in the house next door. After it was sold, as a private residence, the new owners couldn't understand why they didn't get an electricity bill. 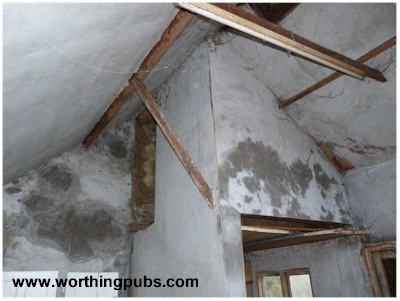 It transpires that it had been connected to the pubs supply by the landlord. (unconfirmed). Many new visitors to the Vine may be unaware that it was originally a Brewery. 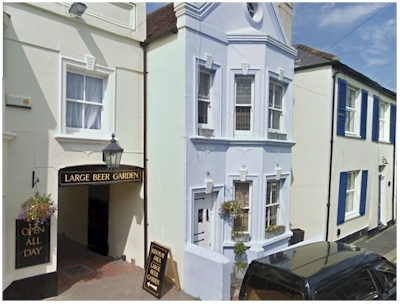 The 'Large Beer Garden' sign shows where the entrance was. A little further inside there used to be a iron horse feeding basket mounted on the wall, this was used to keep the dray horses entertained while the barrels were loaded on the cart. Sadly it has since been removed. They are often mistaken for more modern plant baskets. Very little visual evidence remains of the old brewery itself. In the back garden there is a tower like structure about 25 feet high, and on top of this sat a large cast-iron water tank, which has since been removed. 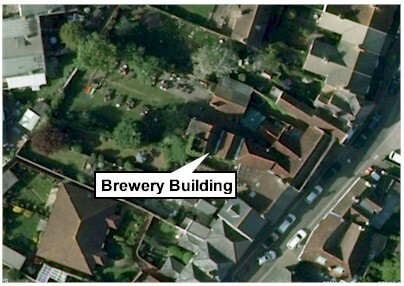 The picture (Right) shows the brewery building and the square, ivy covered tower is still visible. A recent discovery has brought to light a hidden treasure in the back of the building where the brewery used to exist. Its behind that odd corner structure. To see more click here. 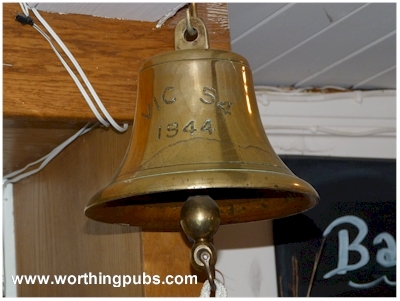 Another recent discovery was this ships bell hanging behind the bar. The inscription reads 'VIC 54 1944'. Research has suggested that this bell once adored a ship known as a 'Victualling Inshore Craft'. These little ships were commission by the admiralty to service Royal navy ships during the war. Around 96 were build. This bell belonged to number 54. 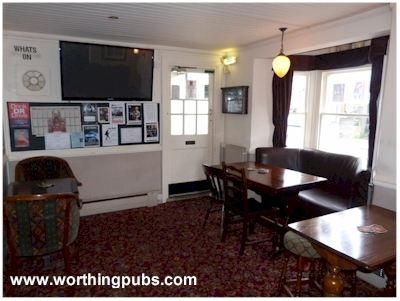 How did it end up in a Worthing pub? I met him when working for London & Edinburgh Insurance at the Warren, where he worked as a Systems Programmer until being made redundant in January 2000 after Norwich Union bought L&E. He subsequently drove a cab for M&D cars, and made many more friends doing this until becoming too ill to continue. He was a man who dearly loved the Vine, and would always make every effort to get back for last orders there, regardless of where he was. 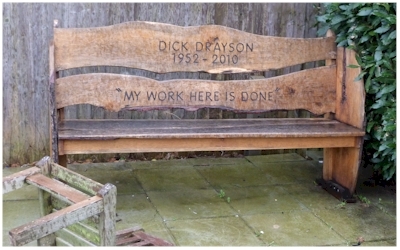 He often joked that he wanted his ashes scattered on the floor of the Vine and then discarded with the rest of the sweepings, but some of his friends did better than that - watch this video on youtube and I think you'll get an idea of how well-loved he was. 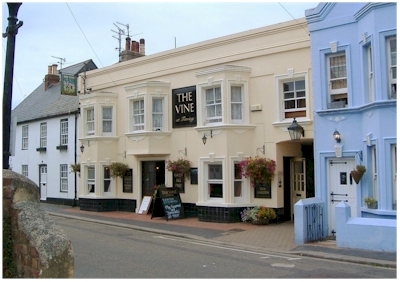 John Chambers turned the Vine in to a free house from its original Ind Coope tied house status. 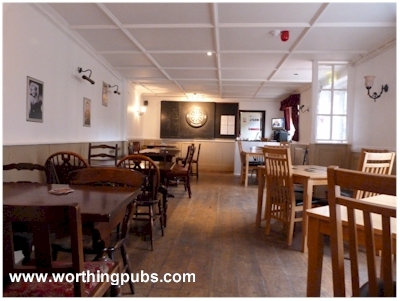 The Vine is a Hall & Woodhouse pub which brews under the name Badger Brewery. 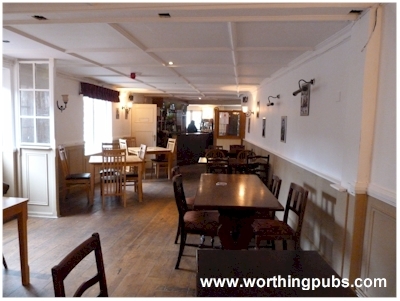 The Vine today follows the now common open plan, single bar layout. There is a large back room area around the corner presently set with tables and chairs. A good range of Real Ales are available. The large raised back garden, with covered smoking area, is ideal for summer events as well as the annual tree wassailing by the Sompting Morris Dancers. The Vine used to be a major host of Real Ale festivals, but these were curtailed by the council due to the vast number of attendees. However a smaller low key event has resumed in 2011. 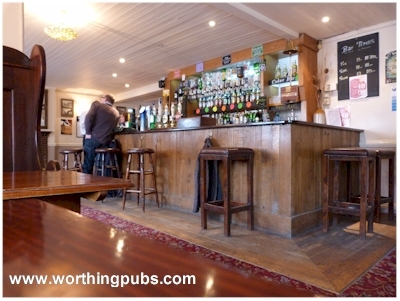 Nick Black (2000-2001) managed to get the pub prelisted in the Real Ale Guide and earned his Cask Marque.